In order to have a strong primary market you must also have a strong secondary market. On this site I am also willing to display any of the $ Series that people have bought in the past and is now currently for re-sale. Just email me the details. Below are the re-sales that I am aware of. I'm pleased to see that people have made good profits from buying my artwork. Leanne Adams sold the �2, $US 3, �4 Paintings to Daniel Maguire �for $US 600 per painting. 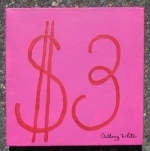 Leanne Adams sold the � 18 Painting to H.R. Fricker who will be giving the painting as a gift to Nora Riss. Cam Schroder sold the �32, �35, � 46, �61, $AU 5, $AU 81, $AU 85, $AU 86, AU 91,� $US 32, $US 35, $US 36, $US 37, $US 38, � 51, �56 on Grays Online. If you bought one of these painting please get in contact with me. Cam Schroder sold the $AU 98 Painting to Greg Martin for $US 200. Frank Mackenzie-Hunt swapped the $AU 7 with Linda Windsor for the � 8 Euro Painting. This gave Frank the only set of four single digits. Frank Mackenzie-Hunt sold the $AU 5 painting to Cam Schroder for an undisclosed sum. Jeremy Campbell �purchased the $AU 105 from Cam Schroder for $US 200. Jeremy will eventually have all four 105's. Jason Cox from the UK has purchased the� $AU 24 , $US 24, � 24 & � 24 from Yeppoon art dealer Frank Mackenzie-Hunt for an undisclosed sum. Jason is the second person to own a set of four. Phil Jenkins who bought the $AU 5,6,7,8,24� $US 5,6,7,8,24� & � 5,6,7,8,24 has recently sold these paintings to Yeppoon art dealer Frank Mackenzie-Hunt for an undisclosed sum. Andrew McClelland sold the $AU 4 Painting to� Cameron Schroder for $AU 500. Art history is won and lost on the secondary market.